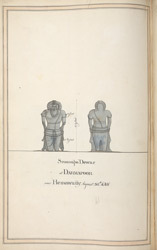 Pen and ink and watercolour drawing dated 30th August 1801, of a free standing sculpture of Vishnu from the Keshava Temple at Dharmapura in Karnataka, taken from an Album of 56 sheets of drawings (60 folios) mainly of miscellaneous architecture and sculpture in the Deccan and S. India, dated 1793-1806, from the MacKenzie Collection. Some drawings are by MacKenzie himself, others by his draftsmen, including C. Ignatio. S. Settar in 'The Hoysala temples' of 1992 remarked, "The Cennakesava image at Dharmapura in Hunsur taluk, is strictly Hoysala in its general schema, but the details of its workmanship are not...The triangular shape of the upper portion of the stela, the absece of the ususal pilasters at the side, the serpentine arch and other details in the upper section of the stela at Dharmapura are noteworthy. An extremely broad straight shoulder and a conspicously concave-shaped torso have added an unusual character to this image. The long, conical crown that rises in multiple rows is similar to that of the Mohini at Belur. The prabha is typically Hoysala, but in its size and the manner of it location, it is different from what it is seen to be in other Hoysala works. The attributes are not stylistically different from those of the Hoysala order, but some of them are smaller and thinner."